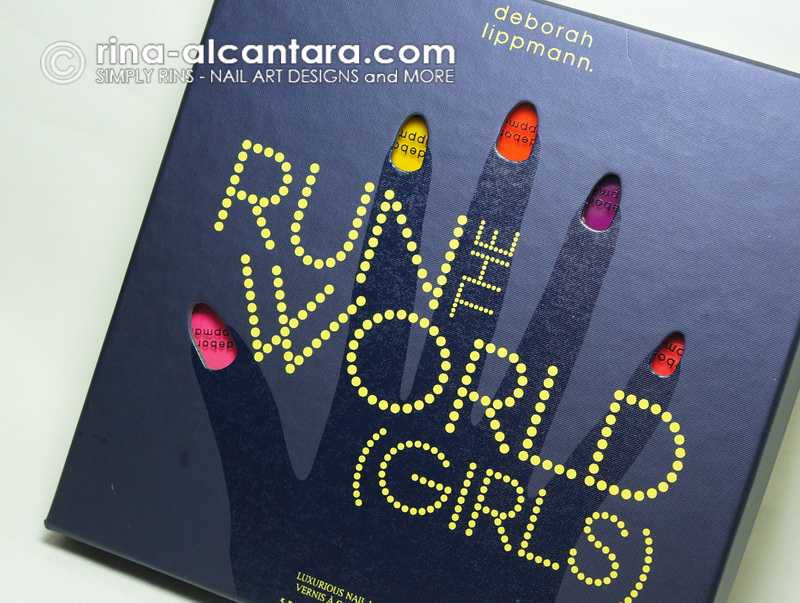 It's the Deborah Lippmann Run the World (Girls) neon minis collection and it comes with an interesting box. I've recently acquired a lemming for polish minis and I was completely amazed when nanay (mother) handed this to me because I didn't know that Deborah Lippmann released such a set. Needless to say, I loved it. The box cover had a printed hand on it and the nails were cut off so the mini polishes inside could act as nail colors. Brilliant! "Experiment and have fun with colors"
The set includes 5 neon shades in mini bottles and they were eye candies! Comparing a regular-sized Deborah Lippmann polish and a mini bottle. Initially, I wanted to swatch each color separately but decided to wear them all together for fun. I know this may sound hilarious but I felt they were like siblings and can't be worn individually. LOL! on Thumb: I Kissed a Girl is described as a poppin' pink. I used 2 coats for complete coverage. It has excellent consistency and applies without a fuss. on Index: It Girl is described as a yellin' yellow. In photo is 3 coats and still wasn't enough for full opacity. I suggest layering this with white if you want it really opaqued on your nails. It has a jelly-like consistency but applies really well. on Middle: Hollaback Girl is described as a outrageous orange. 2 coats is enough to reach full coverage. Another bottle with excellent consistency that will not cause any problems with application. on Ring: Nasty Girl is described as flaming fuschia. I used 3 coats. Consistency was great but application can be very tricky. I actually did not apply it well as my photo reveals. It's uneven. on Pinky: Party Girl is described as sassy salmon. I applied 2 coats and it dried like Hollaback Girl. Consistency and application were not a problem. All these polishes dries matte. But I swatched them with a layer of top coat. I love them with some shine. Overall, I love this collection simply because I love minis and I love Deborah Lippmann. However, I was expecting a more bright finish if they were to call this a neon set. I had a little more fun with these babies by painting some flowers. 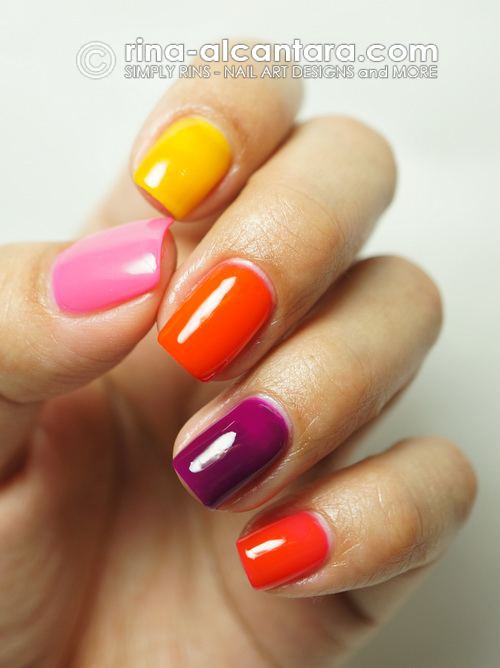 I bet these would look amazing during a trip to the beach or whenever you just want to have some fun with your nails. 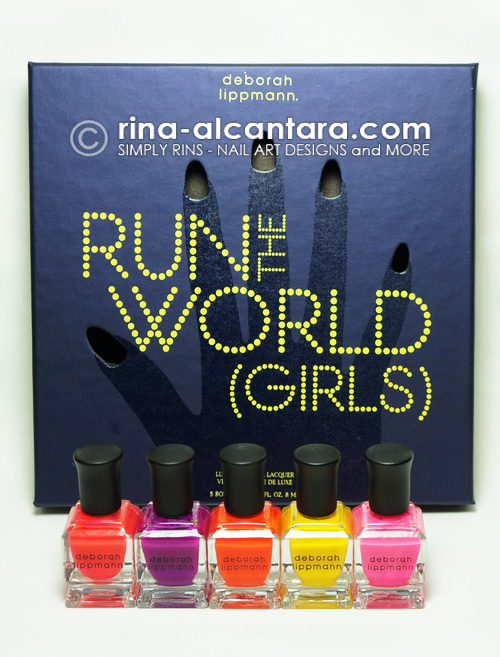 Deborah Lippmann Run the World (Girls) neon boxed set is available at Rustan's Department Stores for Php2,250.00. 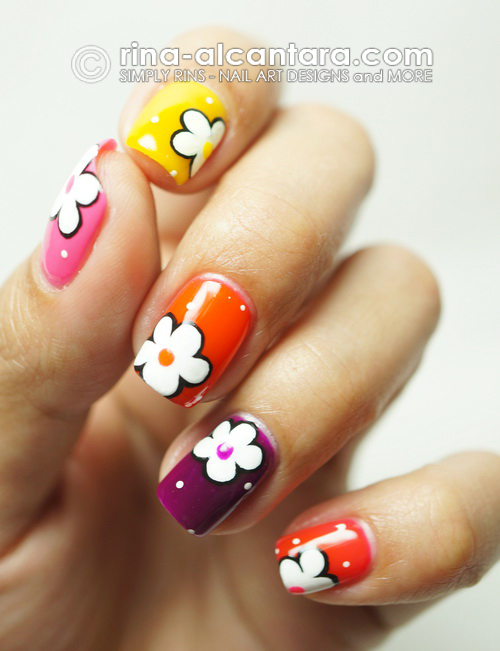 Loved the colours but loved the nail art more! How cute! I like the colors and the box!